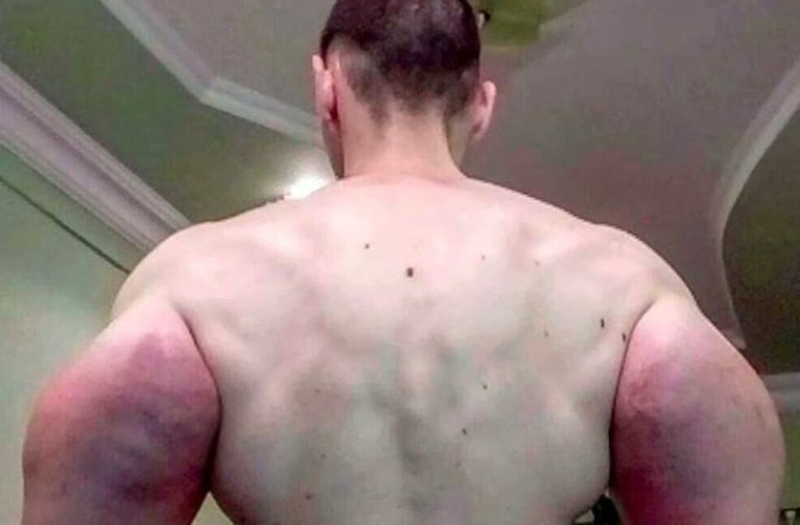 Kirill Tereshin, 21, an ex-soldier from Pyatigorsk, Russia, is taking social media by storm with his abnormally large and swollen biceps, which got that way because he injected them with a chemical called synthol. The result of these injections, which is on full display in images below, has Tereshin being called the “Russian Popeye,” due to the similarities between him and the famous cartoon sailor, Popeye. Tereshin is playing a dangerous game with these chemicals, according to the Daily Mail. The workout warrior’s 24-inch biceps and his method of getting them could mean he’ll “end up disabled,” a doctor said. “He could lose movement in his arms, the muscles could turn into ballast that he won’t be able to use to lift things. He could end up disabled,” Doctor Yuriy Serebryanskiny said. A professional powerlifter also quoted in the Daily Mail said he believes Tereshin needs “complex medical help” and that this is obvious just by looking at his face. Tereshin grew his biceps a whole ten inches in 10 days after leaving the army over the summer and they are now 24 inches thick. Tereshin, for his part, seems to think everything is fine. You can find these images and more on Tereshin’s Instagram, which has more than 17,000 followers. One thing is for sure: this guy has never skipped arm day.